NEW HAVEN, Conn. – For the second straight week, University of Michigan sophomore quarterback Denard Robinson (Deerfield Beach, Fla./Deerfield Beach HS) has been named the Walter Camp Football Foundation National Offensive Player of the Week. Robinson collects this week’s honor after racking up 502 yards of total offense in the Wolverines’ 28-24 victory at Notre Dame yesterday. Robinson led the game-winning 12-play, 72-yard scoring drive against the Irish, capped by his two-yard scoring running with 27 second left in regulation. He accounted for all 72 of the Wolverines yards on the drive, completing 5-of-6 passes for 55 yards and gained 17 rushing yards on six attempts. Robinson set the Big Ten rushing record for quarterbacks with 258 yards on 28 carries against the Irish. His rushing output is the best road effort ever for a Wolverine ground gainer and the fifth-best single-game effort in school history. He set career highs in every passing category, completing 24-of-40 passes for 244 yards and one touchdown. Robinson became the ninth quarterback in NCAA history to run and pass for over 200 yards in a game and the first since West Virginia’s Pat White accomplished the feat against Pittsburgh on Nov. 16, 2006 (220 rushing and 204 passing). In addition to his two-yard game-winning scoring plunge, Robinson raced 87 yards for a touchdown during the second quarter at Notre Dame. 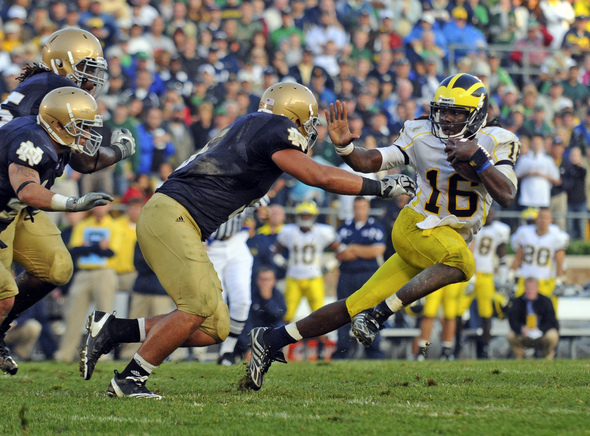 The scoring run was the longest run in Notre Dame Stadium history and the sixth longest run in Michigan football history. Robinson reset the Michigan total offensive record with 502 yards at Notre Dame, surpassing his total of 383 yards set last week against Connecticut. He also set the school record with 68 total offensive plays (28 rushing and 40 passing) in the Notre Dame game. Robinson leads the nation in rushing (227.5 avg.) and total offense (442.5 avg.) through two games. Robinson is the fourth FBS player to earn Walter Camp Player of the Week honors twice in a season. The last player to earn the award twice was Texas Tech quarterback Graham Harrell (won the award twice in a three-week span during the 2008 season). I think Michigan fans are in danger of becoming spoiled with these last two performances. I also think we're extremely TWO-dimensional on offense right now (DRob throwing, DRob running). I mean Denard accounted for 502 of our 532 yards of total offense yesterday. Teams we play from here on out are going to everything they can to stop Denard in hopes that we have no other options of attack. But when you have a player like Denard Robinson, you don't need too many other weapons. Can anyone name Texas's starting running back in 2005? What makes him so dangerous is that he's doing it both on the ground and through the air. The only way to really stop Denard, is to have him not play. Boom! Denarded. 87 yards to glory. I did not predict a 2-0 start. I thought we'd lose to Notre Dame. But we didn't. We found a way to win, on the road in a hostile environment when all the momentum was going against us. How many teams have come from behind to beat ND in South Bend? Parts of yesterday's game were difficult to watch. Some pretty bad holding penalties hurt us. The late hit by Cullen Christian was just a dumb move by a young guy. And of course the 95-yard bomb over Cam Gordon's head was the definition of a blown safety coverage. That coulda, shoulda been a pic. But, we did some things very right. Michael Floyd is one of the best WRs we'll see this year...and James Rogers and JT Floyd played surprisingly well on the corners. We had 1 INT per Irish QB that we saw in the game. AND....I am amazed that we have yet to turn the ball over. Michigan fans rejoice. We should be very happy with a 2-0 start. Stop trying to reason or lessen this feeling. We deserve to enjoy this team, this time, and this amazing start to the 2010 season. We will struggle at times, we will have injuries, we will lose games this year...no doubt. But for now, we're undefeated. 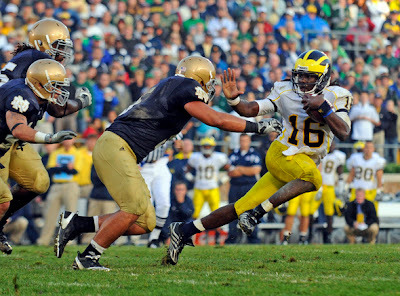 Denard went from unknown, to Heisman leader in two games.